Having been called to this country by V. Rev. Fr. John Trutza, at the recommendation of Viorel Trifa, from 1951-1955 he served as assistant priest at The Falling Asleep of the Ever Virgin Mary Church in Cleveland, Ohio, and administered the parishes in Salem, Martins Ferry and Newark, Ohio and Weirton, West Virginia. 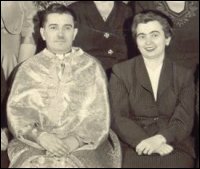 He was then chosen to be parish priest of Sts. Peter & Paul Church in Dearborn, Michigan. Prior to Fr. John’s arrival, the parish had experienced difficult and sometimes heated tensions which the new priest immediately worked to end. He soon made relative peace within the parish and strengthened its ties with The Romanian Orthodox Episcopate of America. Throughout the next 25 years, Fr. John and Psa. 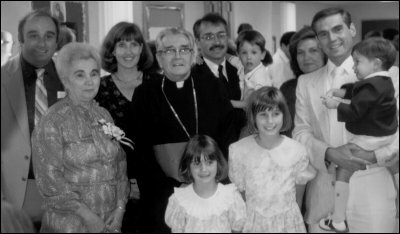 Elena worked tirelessly with the parish to establish a firm foundation upon which future generations could build. It was during his pastorate that the parish relocated to Dearborn Heights and current church and adjacent facilities were built in 1975. Fr. Surducan also remained active on the diocesan level. He was the Administrator of SOLIA (the official publication of the Romanian Orthodox Episcopate) [1951-1952]; Treasurer of the Episcopate; member of the Commission to update the Romanian Orthodox Episcopate By-laws ; member of the Examination Commission for candidates to the priesthood ; member of the Spiritual Consistory [6 years]; Referee on Matrimonial Affairs (Dispensations) [11 years]; served on the Episcopate Council [over 20 years]; President of the Clergy Pension Fund [1964-1970]; Administrative Dean of the Michigan/Eastern Canada Deanery [1978-1982]; and Spiritual Advisor to The American Romanian Orthodox Youth (A.R.O.Y.) . For several years after retirement, Fr. John administered: Sts. Michael & Gabriel Church in Fort Wayne, Indiana [6 years]; The Descent of the Holy Spirit Church in Warren, Michigan [8 months]; and St. Nicholas Church in Detroit, Michigan [7 months]. In recognition of his many years of service, Fr. 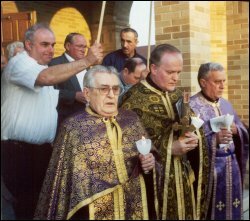 Surducan was elevated to the rank of Archpriest by His Grace, Bishop Nathaniel (Popp) on June 30, 1991. Fr. John fell asleep in the Lord on Monday, January 22, 2007, just days after his 92nd birthday on January 17, following a recent decline in health. Funeral services took place at Sts. Peter & Paul Church on Wednesday, January 24 through Friday, January 26. 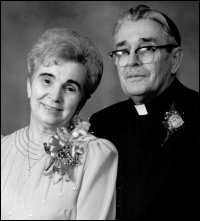 He was then laid to rest next to his beloved wife, Preoteasa Elena, at Woodmere Cemetery in Detroit. He was preceded in death by his wife, Psa. Elena, in January 1997 (almost 10 years to the day). They leave behind four sons: George, John (w/ wife Connie and children John & Matthew), Walter (w/ wife Susan and children Sarah, Caroline & Stephen) and Michael.